Wed., Nov. 7, 2018, 2:03 p.m.
Star-shaped brain cells called astrocytes appear to play an essential role in regulating sleep, a new study at Washington State University Spokane found. Until recently, astrocytes were largely overlooked by scientists as a type of glial or glue cell surrounding neurons, the major players in receiving and communicating nerve signals between the brain and body. But recent findings by WSU researchers and others now suggest that astrocytes are more active, and seem somehow involved in sleep regulation. Scientists William Vanderheyden and Jason Gerstner, with the WSU Sleep and Performance Research Center in Spokane, published a study this past week in PLOS Genetics showing that astrocytes actually communicate to neurons to regulate sleep time in fruit flies, as they might also in humans. “Our work uses the fruit fly as a tool to identify mechanisms of sleep regulation that might be conserved across species – from fruit flies all the way to humans – so we might someday understand the function and process of sleep,” the study said. WSU professors use fruit flies in studies because their genetic make-up is surprisingly similar to that of humans, and with the insect’s short life cycle, they make a powerful tool for researching genetics. Gerstner, assistant research professor in the WSU Elson S. Floyd College of Medicine, said the recent research further supports a few studies in recent years around astrocytes likely playing a role in sleep. Now, scientists think astrocytes are able to release and take up neurotransmitters and other neuro-active substances to suppress or amplify the strength of communication between neurons. 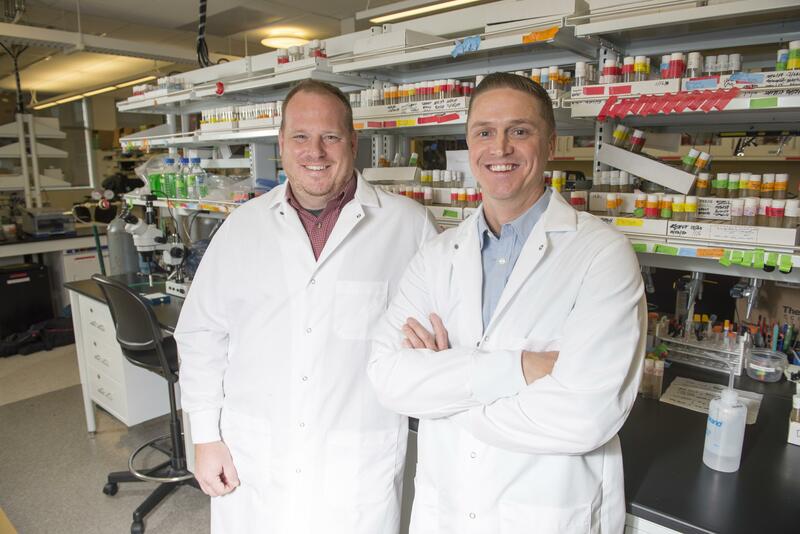 In this recent WSU study, researchers combined ideas around astrocytes with newer knowledge about TNF-alpha, a protein involved in inflammation that has been shown to play a critical role in sleep regulation in humans and other mammals. The study involved breeding a generation of flies in which the gene that controlled Eiger was switched off. These flies slept less overall, and their sleep was also more fragmented. The research further manipulated the flies so that Eiger was switched off in specific brain cell types – either astrocytes or neurons. Researchers saw a similar reduction in sleep in flies with Eiger switched off in astrocytes, but sleep duration in flies with Eiger switched off in neurons didn’t change. The finding suggests Eiger contributes to the regulation of sleep in a way that depends on astrocyte signaling, Vanderheyden said. Next, the group injected human TNF-alpha in both wild-type flies and Eiger mutants and found that, in both groups of flies, it increased sleep, as it had been previously shown to do in mammals. Finally, the researchers experimented by switching off Wengen – Eiger’s receptor – in either astrocytes or neurons and measured sleep time in these flies after 12 hours of sleep deprivation, which normally leads to increased sleep. There was no change in sleep time in flies that had the Wengen receptor switched off in astrocytes, versus control flies. However, flies with Wengen switched off in neurons showed a significant reduction in sleep rebound. Also, injecting human TNF-alpha into flies that had Wengen switched off in neurons did not increase sleep. Next, Vanderheyden and Gerstner plan to take their hypothesis into mammals by studying whether the same astrocyte-to-neuron pathway regulates sleep in rodents. They’re also interested in looking at this pathway in a fruit fly model of Alzheimer’s disease, which is associated with both sleep loss and astrogliosis, an abnormal increase in astrocyte numbers caused by destruction of nearby neurons. The study is insightful regarding how signaling might occur, Gerstner said. Ongoing research is needed because mechanisms underlying sleep regulation remain poorly understood. The academic center in Spokane does research and has sleep laboratories aimed at understanding the neurobiology of sleep and sleep loss, and the effect on metabolism, immune function, cognitive performance and behavior. The studies often focus on ways of ensuring adequate, recuperative sleep and mitigating the effects of inadequate sleep. Different teams of researchers at the center have published other recent studies: uncovering how sleep loss plays a role in Alzheimer’s disease, how night shifts can disturb the body’s metabolism over time, and why some people have an easier time resting than others. “The reason we study sleep is we still don’t understand the function of sleep,” Gerstner said. “We have important clues and ideas, but there isn’t any clear single fundamental process that we have identified that defines what sleep is doing. Published: Nov. 7, 2018, 2:03 p.m.